I. What is a Monologue? A monologue is a speech given by a single character in a story. In drama, it is the vocalization of a character’s thoughts; in literature, the verbalization. It is traditionally a device used in theater—a speech to be given on stage—but nowadays, its use extends to film and television. As you witness some of the greatest acts ever seen in the ring! The ringleader’s speech is directed to the audience. His monologue helps him build anticipation and excitement in his viewers while he foreshadows some of the thrills the performance will contain. You know, I don’t think what you are doing is funny. In fact, I think it is sad. You think you’re cool because you grew faster than some people, and now you can beat them up? What is cool about hurting people? We are all here pretending that you’re a leader, when really, I know that you’re nothing but a mean bully! All this time I’ve been scared to say that, but just now, I realized that I’m not afraid of bullies—so, I won’t be afraid of you! When a conversation stops and shifts focus to a single character’s speech, it is usually a sign of a monologue. In this situation, a group conversation between friends turns into one girl’s response; a monologue addressing bullying and the bully himself. A speech that a character gives to himself—as if no one else is listening—which voices his inner thoughts aloud. Basically, a soliloquy captures a character talking to himself at length out loud. Of course, the audience (and sometimes other characters) can hear the speech, but the person talking to himself is unaware of others listening. For example, in comedy, oftentimes a character is pictured giving themselves a lengthy, uplifting speech in the mirror…while a friend is secretly watching them and laughing. The soliloquy is one of the most fundamental dramatic devices used by Shakespeare in his dramas. A speech that is given directly to the audience or another character. It can be formal or informal, funny or serious; but it is almost always significant in both length and purpose. For example, a scene that captures a president’s speech to a crowd exhibits a dramatic monologue that is both lengthy and important to the story’s plotline. In fact, in TV, theater ,and film, all speeches given by a single character—to an audience, the audience, or even just one character—are dramatic monologues. The expression of a character’s thoughts so that the audience can witness (or read, in literature) what is going on inside that character’s mind. It is sometimes (depending on the style in) referred to as “stream-of-consciousness.” In a piece of writing, internal monologues can often be easily identified by italicized blocks of text that express a character’s inner thoughts. On TV and in films, internal monologues are usually spoken in the character’s voice, but without seeing him actually speak; thus giving the feeling of being able to hear his thoughts. Monologues give the audience and other characters access to what a particular character is thinking, either through a speech or the vocalization of their thoughts. While the purpose of a speech is obvious, the latter is particularly useful for characterization: it aids the audience in developing an idea about what the character is really thinking, which in turn helps (or can later help) explain their previous (or future) actions and behavior. This scene reveals to the audience that Hamlet is contemplating suicide. His words express an internal thought process that we would normally not be able to witness. The only reason that Shakespeare has Hamlet speak these words out loud is so that the audience—not anyone else in the play—can hear them. He uses a soliloquy to share Hamlet’s unstable state of mind and disquieting thoughts. There was a feller here once by the name of Jim Smiley, in the winter of ’49—or may be it was the spring of ’50—I don’t recollect exactly, somehow, though what makes me think it was one or the other is because I remember the big flume wasn’t finished when he first came to the camp; but any way he was the curiosest man about always betting on any thing that turned up you ever see, if he could get anybody to bet on the other side; and if he couldn’t, he’d change sides. Any way that suited the other man would suit him—any way just so’s he got a bet, he was satisfied. But still he was lucky, uncommon lucky; he most always come out winner. Mark Twain was a literary genius when it came to storytelling—he could make the page seem like a stage with the way he used spelling and grammar to bring a character’s accent and personality to life. Wheeler’s story is a dramatic monologue, which Twain used to achieve the feeling of a real storytelling exchange between two people. His employment of this dramatic technique in this short story makes the readers feel like they are hearing Wheeler’s story firsthand. Every day he woke up and told himself, ‘Rest in peace; now get up and go to war,’” says Rick. “After a few years of pretending he was dead, he made it out alive. That’s the trick of it, I think. We do what we need to do, and then we get to live. No matter what we find in D.C., I know we’ll be okay. This is how we survive: We tell ourselves that we are the walking dead. Here, Rick’s monologue begins when the dialogue ceases to be a group discussion. Now he alone is speaking to the group—he is giving a dramatic monologue. 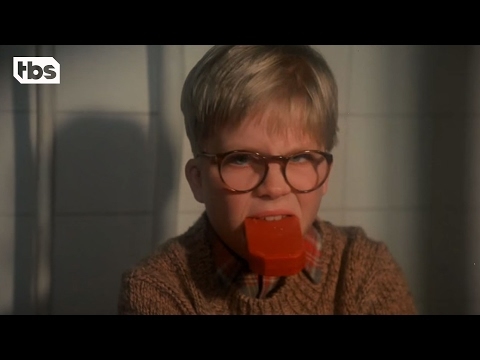 In one of the most popular Christmas movies to date, A Christmas Story, the protagonist Ralphie is also the narrator. However, the narration is internal: Ralphie isn’t speaking directly to us, but he is openly letting us in on his thoughts. As you’ve now heard in this clip, Ralphie’s voice is that of an adult man, and that’s why the narration style in this film is unique—adult Ralphie is simultaneously reflecting on the past and reenacting present-Ralphie’s thoughts. The mental debate he has about who taught him the curse word and what to tell his mother is an internal monologue: we can hear his thoughts; thus the situation is funnier and more thought provoking. An aside is when a character briefly pauses to speak directly to the audience, but no other characters are aware of it. It is very similar to a monologue; however, the primary difference between the two is that an aside is very short; it can be just one word, or a couple of sentences, but it is always brief—monologues are substantial in length. Furthermore, an aside is always said directly to the audience, usually accomplished (in film and television) by looking directly into the camera. As an example, asides are a key part of the style of the Netflix series House of Cards; the main character Francis Underwood often looks directly into the camera and openly addresses the audience as if they are present, while the other characters do not know that the audience exists. While a monologue is a given by one character (“mono”=single), a dialogue is a conversation that occurs between two or more characters. Monologues and dialogues are similar in that they both deliver language to the audience. For instance, in a movie, a race winner’s speech is a monologue, however, a speech collectively given by several members of a team is dialogue. Both techniques can address the audience, but the difference lies in how many people are speaking. In conclusion, monologues (and dialogues) are arguably the most fundamental parts of onstage drama and dramatic literature. Without them, essentially only silent film and theater could exist, as monologues provide the only way for the audience to witness a character’s thoughts.